Daedra (/diː.dɹə/ or /deɪ.dɹə/) are divine beings that did not take part in the creation of the Mundus, and thus retain the full breadth of their power. 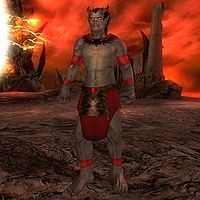 They have a very real impact on the mortal realm; in one way or another, Daedric influence touches everyone on Tamriel. 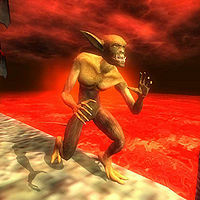 The word "Daedra" is of Aldmeri origin, and its exact meaning is "not our ancestors", as opposed to Aedra - "ancestors". Technically, only the plural is written "Daedra", but this word is frequently used in singular as well. The proper singular form is "Daedroth", but that has come to refer to a specific species of Daedra. Different cultures have their own myths and names for Daedra. 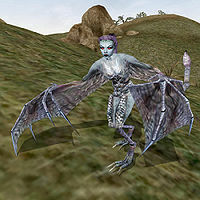 For instance, the Khajiit rarely speak of the "Dro-m'Athra", dark spirits that are believed to be Daedra by another name. A Daedroth's physical form can be ruined, but it cannot be truly killed; the soul or Animus of a slain Daedroth returns to the void of Oblivion until it manages to coalesce into a physical form again. A slain Daedroth is often said to have been "banished" or "purged" instead of "killed" to reflect this. 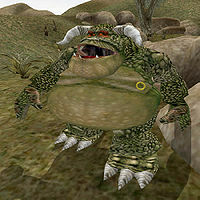 Daedra are the undisputed masters of craftsmanship, creating seemingly indestructible armors and the mightiest of weapons through dark rituals. Daedric weaponry is said to be forged from the highest quality of raw ebony. The objects get their power from a Daedric soul forged into the ebony. Letters for the Battlespire Hero de Vatasha Trenelle and Josian Kaid — A series of letters from two Battlemages to anybody who might be following in their path. Esta página foi modificada pela última vez à(s) 19h49min de 22 de fevereiro de 2016.